The shell of the jacket. 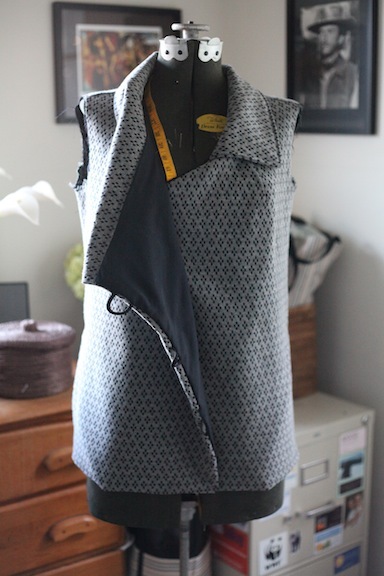 The birthday jacket is coming along swimmingly. 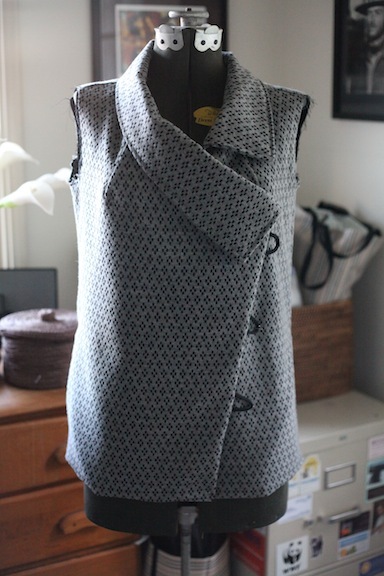 Though the progress isn’t obvious from the picture above, the jacket has leapt forward from a few sewn together pieces of fabric with a collar to a decent shell. All from the addition of the lining. A peek at the lining. I used a cotton/bamboo mix since I wanted the lining to be black and that was all this particular store carried in an all-natural black fabric. They did have a lovely all-cotton shiny red, which would have been fabulous as a lining if the pattern were slightly altered. See how the lining goes all the way to the edge in the photo above? I didn’t want any lining peeking out and distracting from the gorgeous fabric. Red would shout, “Look at me!,” while black demurely fades into the background. If the pattern had been designed such that the edge of the lining was made from the fashion fabric, such as in the ready-to-wear jacket of mine shown below, I would have greedily grabbed up the red. 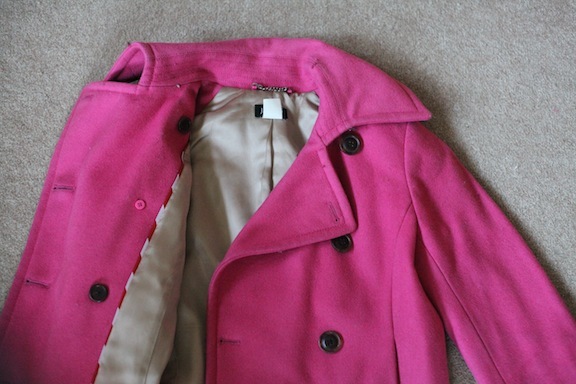 A ready-to-wear jacket and its lining. I imagine the extra pieces required for building the lining from both the fashion fabric and a lining fabric would have pushed this pattern out of the “Very Easy Vogue” category. I’m thankful that I started with an easier pattern, but I’m hopeful that if I ever make Vogue 8429 again, I’ll have the experience necessary to modify the pattern to allow for an edge of fashion fabric in the lining. Then, hello, Red, nice to meet you!